This is the soup that started it all for Comida Loca in their small deli in the Albuquerque Airport. This award winning soup offers an unforgetable taste of the southwest. 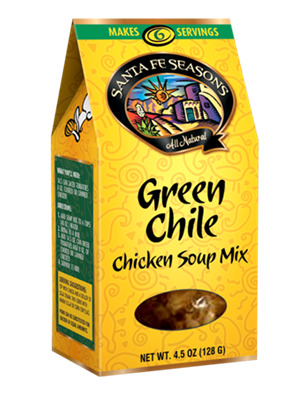 Now made by Santa Fe Seasons, this soup mix is the same famous recipe that has delighted green chile soup lovers for years! Add contents to 6 cups (48 oz.) water. Top with cheese and a dollop of sour cream. Then serve with warm flour or corn tortillas. Pork can be substituted for chicken in equal amounts, but then you'll have to call it Green Chile Pork Soup. It's up to you. Potatoes, Chicken Soup Base (salt, sugar, chicken fat, maltodextrin, hydrolyzed soy protein, garlic, dehydrated onion, turmeric, natural flavorings), Green Chile, Minced Onion and Granulated Garlic. Contains the following allergens: Soy.